For the avid traveler, India provides an authentic adventure - stimulating, absorbing, daunting,sometimes moving and shocking. Here is one of the world's great dramas; an ancient, vast and crowded land committed to the most formidably challenging exercise in mass democracy. It is a spectacle in which hope, pride, paradox and uncertainty mingle and struggle. It is conducted on the whole, and to India's credit in the open. ALL IN PRICE: $3195 CAD PER PERSON *(Depending on seasonality, departure location and number of travelers). Cost: CAD $1165 PER PERSON for 1 week. 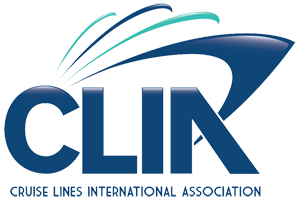 A representative for assistance on arrival and departure transfers at airport/railway station. 9 nights hotel accommodation on twin sharing basis in base category of rooms "or similar". Daily breakfast at hotel (buffet/fixed menu). 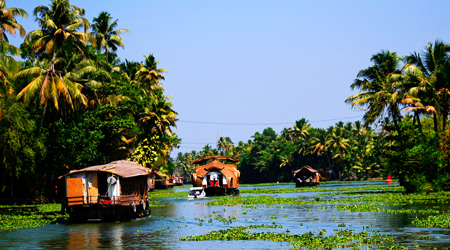 All three meals on houseboat in Alleppey. All transfers and sightseeing by air-conditioned Toyota Innova vehicle as per program. English-speaking local guide for the sightseeing as per program. 1 Elephant ride to ascend (alternatively by jeeps) to Amber Fort in Jaipur. 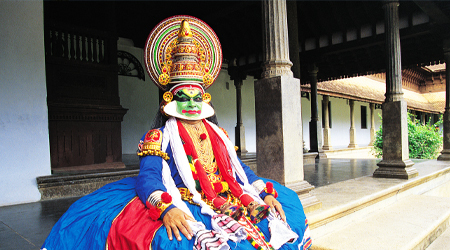 Kathakali dance performance show entry ticket in Cochin. 1 bottle per person per day packed drinking water available in the vehicle during sightseeing/long drives. On arrival, clear immigration & custom. After picking up your luggage, walk towards the arrival hall where our representative will meet and transfer you to your hotel. 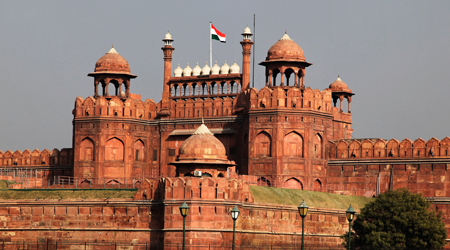 Delhi, the capital of India has a fascinating history and a stimulating present. Delhi has been the seat of a power of a number of dynasties – the Rajputs, the Muslims invaders from the North, the Afghan dynasties followed by Tughlaqs, Sayyads, the Ladies and the Mughals, who continued the Imperial line, until British days. The old city, built by Shah Jehan in the 17th century, stands today as an epitome of the whole history of Indo-Islamic architecture. New Delhi, designed and constructed by Sir Edwin Lutyens and Sir Herbert Baker is a mixture of east and west. The public buildings in red sandstone are in the Mughal style. New Delhi, has a circular Parliament House and an imposing Central Secretariat in two blocks, which stand at the approaches to Rashtrapati Bhavan, the residence of the President of India. Delhi is today the political, economic and cultural capital of the world’s largest democracy and has also become one of the greatest tourist centers of the world. Breakfast at the hotel. Later depart for guided sightseeing tour of Old and New Delhi. In Old Delhi, the capital of Muslim India between the 17th and 19th centuries, visit the Jama Mosque (1656) and enjoy rickshaw ride the fabled area of Chandni Chowk. Then we drive past the Red Fort (1639-1648). Later visit Raj Ghat to pay homage to the Father of India's Nation Mahatma Gandhi. The Jama Masjid, the great mosque of Old Delhi is the largest in India, with a courtyard capable of holding 25,000 devotees. It was begun in 1644 and ended up being the final architectural extravagance of Shah Jahan, the Mughal emperor who built the Taj Mahal and the Red Fort. The highly decorative mosque has three great gates, four towers and two 40 m-high minarets constructed of strips of red sandstone and white marble. **Travellers can hire robes at the northern gate. This may be the only time you get to dress like a local without feeling like an outsider so make the most of it. Raj Ghat: The simple square platform of black marble marks the place where the father of the Nation, Mahatama Gandhi was cremated. In New Delhi, visit India Gate (War Memorial), drive past President’s House, which was once the Viceroy’s Palace, Parliament House and Secretariat buildings. Qutab Minar – The Qutab Minar, 234 feet high tower itself is a soaring tower of victory that was started in 1193, immediately after the defeat of the last Hindu kingdom in Delhi. It is nearly 73m (243 feet) high and tapers from a 15m (50 feet) diameter base to just 2.5m (9 feet) at the top. The tower has five distinct storeys, each marked by a projecting balcony. The first three storeys are made of red sandstone, the fourth and the fifth of marble & sandstone. Also visit India Gate (War Memorial), President’s House, which was once the Viceroy’s Palace, Parliament House and the Secretariat buildings. Humayun’s Tomb (Tomb of Mughal Emperor Humayun) - built in the mid 16th century by Haji Begum, the Persian-born senior wife of Humayun, the second Mughal emperor, this is a wonderful early example of Mughal architecture. Check out, meet your driver and depart by road to Agra. Arrive Agra and check in at your hotel. In the afternoon, meet your local guide in the hotel lobby and depart for guided tour to visit Agra Fort and Taj Mahal. One of the most popular tourist destinations in India, Agra is situated on the west bank of the river Yamuna, in the state of Uttar Pradesh. Marked on the globe due to its architectural wealth Agra boasts of some of the finest architectural splendors in the world. Agra holds some of the finest monuments of Indian history. Agra Fort - Agra is not only famous for Taj Mahal but the impressive Mughal Red Fort known as the Agra Fort. The city built by Emperor Akbar and beautified with palaces and gardens by Jehangir is dominated by Agra Fort. The crescent-shaped fort is enclosed by its 20-metre high, 2.4 km long outer walls. The fort contains a maze of buildings forming a small city within a city. One enters the fort through the Amar Singh Gate, into the southern part of the fort which includes nearly all the buildings of tourist interest. Jehangir’s palace commissioned by Akbar was the largest private residence in the fort. The Diwan-i-Aam (hall of public audience) and Diwan-i-Khas (hall of private audience) were built by Shahjahan for receiving audiences. Musamman Burj, an octagonal tower, stands close to Diwan-i-Khas. Taj Mahal – A symbol of eternal love, which stands on the banks of River Yamuna, was built by the 5th Mughal Emperor, Shah Jahan in the year 1631 in memory of his wife, Mumtaz Mahal. It was completed in 22 years. The Taj Mahal is widely recognized as "the jewel of Muslim art in India and one of the universally admired masterpieces of the world's heritage". It is regarded by many as the finest example of Mughal architecture, a style that combines elements from Persian and Indian architectural styles. In 1983, the Taj Mahal became a UNESCO World Heritage Site. Check out, meet your drive and depart by road to Jaipur en-route visit Fatehpur Sikri. Fatehpur Sikri - is an epic in red sandstone monument. A city of yesteryear today lost in the midst of time. Fatehpur Sikri was built by the Mughal Emperor Akbar during 1564 A.D. Since the Mughal Emperor Akbar had no heir, he visited holy men to enlist their prayers for a son. When he visited Sheikh Salim Chishti who was living at the village of Sikri, the saint foretold the emperor that he would be blessed with a son. When his son was born, he constructed his capital city and named it Fatehpur Sikri. Later, due to a shortage of water and unrest in the North-West, Akbar had to abandon this city. The beautiful marvel tomb of Sheikh Salim Chishti still attracts thousands who seek blessings of the revered saint. Continue on your journey to Jaipur and check in at hotel. Rest of the day is at leisure. 8:30 am meet your local guide in the hotel lobby and depart for guided sightseeing tour of Jaipur to visit Amber Fort, the former capital of the royal Rajputs. Amber Fort was built by Raja Man Singh I. Amber Fort is known for its artistic style of Hindu elements. With its large ramparts, series of gates and cobbled paths, the fort overlooks the Maota Lake, at its forefront. The aesthetic ambiance of this formidable fort is seen within its walls on a four level layout plan (each with a courtyard) in a well turned out opulent palace complex built with red sandstone and marble consisting of the Diwan-e-Aam or the "Hall of Public Audience", the Diwan-e-Khas or the "Hall of Private Audience", the Sheesh Mahal (mirror palace) or Jai Mandir, and the Sukh Niwas where a cool climate is artificially created by winds that blow over the water cascade within the palace. 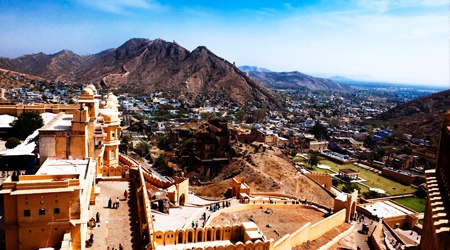 Hence, the Amer Fort is also popularly known as the Amber Palace. The palace was lived in by the Rajput Maharajas and their families. At the entrance to the palace near the fort’s Ganesh Gate, there is also a temple dedicated to Sila Devi, a goddess of the Chaitanya cult which was given to Raja Man Singh when he had defeated the Raja of Jessore, Bengal in 1604. (Jessore is now in Bangladesh). Ascent to the fort on Elephant / Jeep ride, and take a Jeep ride on the return. In the afternoon, proceed for a Jaipur City tour. Hawa Mahal - a five-storied structure of pink sandstone with semi-octagonal and delicately honeycombed windows overlooking the main street of the old city. It was built in 1799 so that veiled royal woman could peer down unseen by the world through its 593 stone screens. City Palace Museum - The City Palace in the heart of the old city is a blend of Rajasthani and Mughal architecture. The center of the palace is a seven storied building called Chandra Palace, with fine views over the gardens and the city. The City Palace includes the Chandra Mahal and Mubarak Mahal palaces and other buildings. The Chandra Mahal palace now houses a museum but the greatest part of it is still a royal residence. The palace complex, which is located northeast of the centre of the grid patterned Jaipur city, incorporates an impressive and vast array of courtyards, gardens and buildings. The palace was built between 1729 and 1732, initially by Sawai Jai Singh II, the ruler of Amber. He planned and built the outer walls, and later additions were made by successive rulers right up to the 20th century. The credit for the urban layout of the city and its structures is attributed to two architects namely, Vidyadar Bhattacharya, the chief architect in the royal court and Sir Samuel Swinton Jacob, apart from the Sawai himself who was a keen architectural enthusiast. The architects achieved a fusion of the Shilpa Shastra of Indian architecture with Rajput, Mughal and European styles of architecture. After that, visit the Solar Observatory - an astronomical treasure house, with solar device that gives accurate predictions till date. Check out, meet your representative and you will be transferred to airport to board flight for Mumbai. Immediately upon arrival, connect flight for Cochin. Arrive Cochin, pick up your luggage and proceed towards exit gate. Meet your representative and you will be transferred to your hotel. Arrive and check in at the hotel. Rest of the day is at leisure. Later meet your guide at hotel and proceed for a sightseeing tour of Cochin visiting - 'The Jewish Synagogue ' at the heart of what is locally called the Jew Town, 'The St. Francis Church', the oldest European Church in India, 'The Santa Cruz Basilica' originally built in 1557 by the Portuguese, The Dutch Palace and the 'Chinese fishing nets' huge cantilevered fishing nets believed to have been brought to Kochi by Chinese traders. In the evening depart to witness the famous Kathakali Dance performance show: A special treat awaits us this evening as we proceed to witness the strength and vigor of Kathakali dance drama, as it enacts episodes from great Indian epics. The extremely stylized gestures, the elaborate make-up, the masks and the splendid costumes of these all-male dancers, recreates an incomparable sense of pageantry. bonded paddy fields and manual canoes of different sizes cress-crossing each other. The experience enables you to reach beautiful untouched areas. Breakfast on board. In time, disembark (maximum by 0930 hrs. ), meet your driver and depart by road to Ayurveda Resort. In time, pick up from Wellness resort and transfer to Cochin airport to board flight. Interested in SAVE $150 Per Couple on a Taste Of India with Tourcan Vacations ?